Bafetimbi Gomis' headed goal stunned Arsenal late as Garry Monk's Swansea side implemented a superb defensive strategy and stole three points to everyone's shock at the Emirates. With the Gunners riding in hot form, up stepped the underrated unit that is Swansea City as Garry Monk's men seeked to stall Arsenal's nicely-flowing momentum. The early tactics implemented were visible within a matter of minutes. Arsenal would dominate possession, ease their way up into Swansea's box, while the visitors would sit back, absorb the pressure and hit the Gunners on a counter-attack with raw pace. Garry Monk had previously criticized Jonjo Shelvey's work-rate, but there was no possible complaint to make early on as the Englishman pounded pressure on Arsenal's midfield and would even lead a couple of Swansea attacks himself. However, he could make a judgement on Shelvey's style of tackling, as he clumsily gave away multiple fouls, most on Sanchez due to the Chilean's blistering pace and movement. There weren't many eye-catching moments early on; as Arsenal controlled possession in the middle of the park with Swansea sitting back in a defensive style of play. Once the Gunners lost the ball though, Monk's men wasted no time in stretching the hosts. Montero lead a promising counter down the left and used his blistering pace to, well, attempt and trouble the Gunners but the move wouldn't lead to anything. Arsenal were being frustrated by a clever game-plan that was working to perfection. The home side failed to get in behind Swansea's back line and fully challenge their former goalkeeper Fabianski. The problem for Swansea was whenever they dispossessed Arsenal, too many numbers were either dotted at the half-way line or behind the ball which slowed down any possible build-up play or counter attacks that Monk's men were looking to execute anyway. Sanchez retrieved possession in the middle, accelerated further towards enemy territory until feeding Giroud outside the box, who took the ball, strode forward and unleashed a sweet curling shot. Always going wide, but a decent effort from the Frenchman. Arsenal were just beginning to up the tempo late in the second half, and a clear-cut chance was presented for Ramsey as he latched onto a long-ball over the Swans' back line. He scampered into the box in anticipation of it but the alert Fabianski prevented him from getting any contact on the ball; gathering well under pressure. Swansea hadn't had a catalogue of chances due to their defensive style, but you'd expect them to at least hit the target once opportunities did present themselves. Coquelin closed Montero down, but couldn't dispossesses his man until Ramsey who came to help out was sucked into a trap and both Arsenal players lost out as Montero sped away. Leaving them for dead, the left-winger's drilled shot would blooter wide of goal. The first 45 minutes soon passed, with both sides locked in a stalemate. Swansea were undoubtedly the happier of the two teams; frustrating Wenger's men with a defensive style of play that prevented any movement available for Sanchez, Giroud and Ozil up top. Garry Monk's plan was working to perfection, and Arsenal needed to do something about to stop it. Only one had to wonder whether Swansea were planning to steal the win or just maintain their position in the match and settle for a draw. Bellerin sneaked past Montero and made a terrific run down the right, before crossing low to Giroud who was poached in the middle. Unfortunately for the Frenchman, a vital interception would deny him of getting a toe to it. In perhaps Arsenal's most promising attack, Giroud cushioned a long-ball down to Sanchez, who dazzled into the area, took it on his right foot and had a pop at goal. Positioned in a tight angle near the byline, the Chilean lacked pure accuracy and his effort pummelled into the side netting. 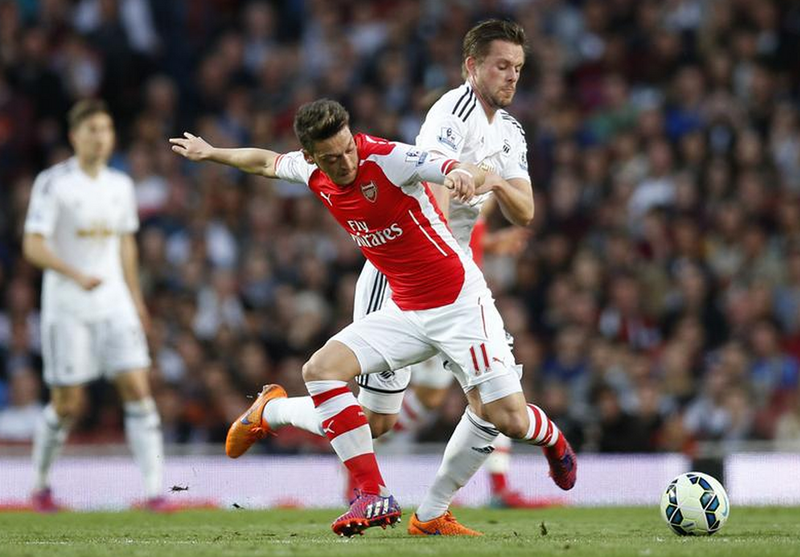 Swansea's disciplined rear-guard began to crack and Arsenal exploited the holes. The Gunners deployed a much more caution approach to attacking in the first half, but Wenger clearly injected his players with urgency and it exemplified in their play. They were playing some fabulous football. However, the visitors were just reminding Arsenal not to get careless up top; with potential counter-attacks on standby. Montero and Dyer linked up on numerous occasions, but the Gunners' tight guard blocked out any danger. Arsenal were hovering around the visitors' area, in search of their first shot on target. It occurred when Ozil squared a sweet pass to Giroud in the middle of the area. The Frenchman struck first time, but Fabianski plunged down low to smother the effort into his grasp. Ramsey zigzagged in-between his marker, switched to his left, then to the right and battered a strike at goal. Unluckily, he saw his effort plunge into the side netting. Wenger's men were becoming closer and closer to breaking the deadlock, though. Theo Walcott and Jack Wilshere were both brought on in an attempt to break the deadlock, to the home fans' delight as "Theo!" chants bellowed around the stadium. With twenty minutes remaining, all the pressure was piled on Swansea and Monreal almost put Arsenal ahead with a sharp run inside the area. It was a glorious chance for the Spaniard, but Fabianksi covered the effort well at his near post. The home side would then test Fabianksi like never before when Ramsey's flick from outside the box found Sanchez poached in the middle, and the Chilean chested down and fired a solid effort at close range. His strike pummelled off Fabianski and the follow-up failed to be converted. Moments later, the Swansea man plunged down low to keep out Ramsey's drilled effort at goal. Fabianksi was undoubtedly a potential man of the match, he made numerous match-saving stops. In perhaps one of the most bizarre moments of the season, Swansea stunned Arsenal and took the lead. Gomis, a substitute, rose high to latch onto a header where he fired it at goal, but Ospina's efforts to keep the effort out weren't enough. Goal-line technology was used and the footage showed that Gomis' header did indeed cross the line. The Emirates was silenced as Swansea players celebrated, to Ospina's disbelief and protests. Proof that the addition of goal-line technology is invaluable. Doubt many thought Gomis header was in at first glance. Thousands had already left the stadium, and they didn't miss a late Arsenal goal as Kevin Friend blew the final whistle; officially marking Swansea's season double over the Gunners. Garry Monk has got to be a contender for manager of the year. Bafetimbi Gomis' late headed goal stunned Arsenal late as Garry Monk's Swansea side implemented a superb defensive strategy and stole three points to everyone's shock at the Emirates.